We have spent a few days in the beautiful Pittwater just north of Sydney. For special treat on Valentines day we went to Cottage Point Inn for lunch. Absolutely fabulous food beautifully presented. we were the only guests who didn’t arrive by sea plane. 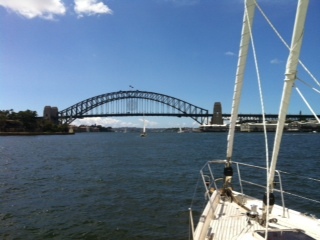 The Etchells national champions were racing this week and next the worlds start here in Sydney. We wish the Lennon-King team all the best. Sadly we can’t stay, the weather ‘window’ is open. We are waiting for customs to clear us out.